Did you know that there’s a Braille version of Monopoly? An edible chocolate edition, too? As part of the 80-year anniversary of the classic family board game’s release, we’re exploring a few Monopoly fun facts. Upon its launch in 1935 by Parker Brothers, the iconic real estate game quickly gained popularity, selling 35,000 sets weekly in just the first year. Today, the gaming giant Hasbro owns Monopoly, and it’s as in-demand as ever, selling in 114 countries. Want more Monopoly tidbits and trivia? Take the quiz. 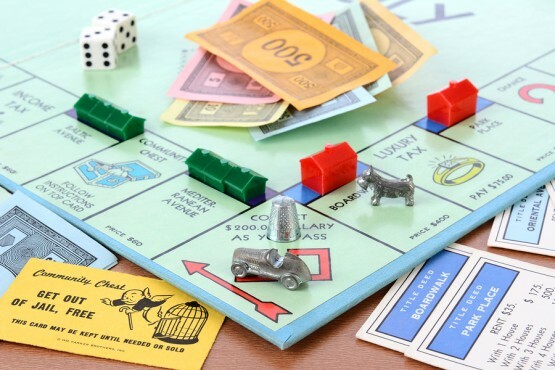 Generations of families have spent hours going bankrupt and buying up Boardwalk and Park Place in one of the most iconic board games of all time. Are you among them? Pass go and test your Monopoly trivia chops as this classic game turns 80 years old. Monopoly games come with $20,580, and each player is given $1500 to play with. True or False: During World War II, real money, maps and compasses were smuggled in Monopoly Games for English prisoners in German POW camps. TRUE. The items were meant to aid POWs in escaping. How many different languages do families across the globe get to enjoy Monopoly in? Monopoly is only produced in English. 47! They don’t all use the same Atlantic City, NJ streets either. Most international editions feature local landmarks and currencies. True or False: Monopoly was created by Charles Darrow. FALSE. Yes, Charles Darrow created Monopoly and sold it to Parker Brothers for distribution in the 1930s. His status as creator of the game’s concept, however, is disputed. A woman named Magie Phillips patented a “Landlord’s Game” with very similar structure decades earlier in 1903. What’s the longest game of Monopoly ever recorded? True or False: In Europe, an 80th edition Monopoly game will have 20,580 real Euros inside. TRUE. One lucky purchaser will find 20,580 Euros in their new Monopoly game, and many more sets will receive other amounts of real cash. Which of these was not part of the original player pieces (AKA tokens)? Guitar. The original ten were a racecar, thimble, shoe, rocking horse, iron, top hat, battleship, cannon, purse and lantern, although several have been retired and replaced over the years. True or False: Hasbro decided not to release a Monopoly version for the iPhone to honor its traditional, family board game origins. FALSE. The digital Monopoly game for iPhone was released in 2008. Digital or face-to-face, we can never have too many Monopoly versions, now can we? $2. Today a standard Monopoly game will cost you about $18. True or False: Monopoly is so popular worldwide, there are even annual World Monopoly Championships. TRUE. A player from Norway won the latest title, and a U.S. player hasn’t won the Monopoly World Championships since 1974. Looks like it’s time to bring out those boards and get rolling! I got 9 out of 10, and wow 70 days of playing monopoly!? I don’t think I could do that. I was surprised when my social studies put the longest time recorded for playing monopoly. The first one six out of ten. The second one nine out of ten. Wow, 70 days straight of just playing monopoly! That is amazing. I know I could never play a game for that period of time. Okey 70 days wow Hey people make videos of a seventy day game on youtube in parts okey. i love your show and the two tests you put out. Nice! I will definitely be playing with all my classes! i had no idea monoply was that popular!